This four-star hotel used to be the Novotel. 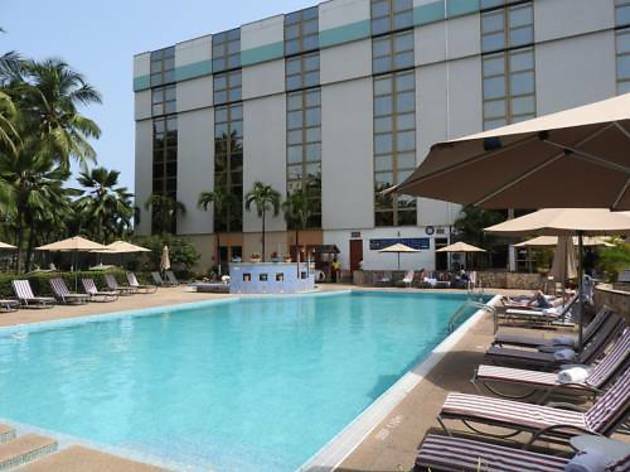 Now renamed the Accra City Hotel (tagline: ‘The Business Haven’), it still has the same owners, although there are big plans to expand and improve the offering. It’s been looking tired in recent years, but with its newfound independence comes the chance to remodel the garden, the pool and the tennis court area. When we visited, the lobby, bar and restaurant were already looking smarter. There’s more life in the bar as well, with live music every night. Other improvements will include better internet access and a free minibar. The focus on local art continues, and there’s now a monthly charity art auction. 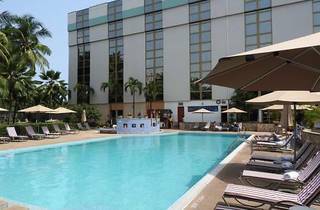 It has a total of 196 rooms, including some superior rooms and larger suites. There are great bargains to be had as well, especially on weekends. Rates from $375 double. Rooms 196. Credit AmEx, MC, V.